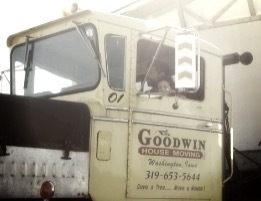 Goodwin House Moving is a family owned business that has been around since 1930. We are in our fifth generation, with the sixth anxiously awaiting to grow up and be a house mover too. Our equipment is well maintained, modern and reliable so you have the security of knowing that your structure is being moved with over 80 years of experience and knowledge using today's technology. We have moved - wood frame homes, log homes, cement structures, brick homes, historical buildings, barns, sheds, cement stave silos, tanks, all glass green houses, grain bins and masonry structures. To raise it and put in a new foundation increases the value and looks of your home. If you choose to move your home, you can consider no neighbors or new neighbors. You could save 10-15 old growth trees (that is 100 new growth!) by moving a house. Turn your old gloomy basement into a beautiful living space. Turn your one-story, into a two-story house. Turn your ranch into a split-level. We have found that a lot of people don't know a lot about structural moving. Feel free to refer to our checklists to help guide and inform you, as a home owner, of what needs to be taken into consideration and what needs to be done in order to successfully move or raise a structure. Interested in Moving a House? Or maybe just raising one? Click to learn more. We are Proud Members of the International Association of Structural Movers..
We are Proud Members of the Texas Association of Structural Movers.